Movie Review: Writer, director and co-producer, Frank Hall Green, presents his sophomore fictional feature, which arrives with plausibility and dramatic strength, and leaves not only with uncertainty, but also with a steady light of hope at the end of a dark tunnel. 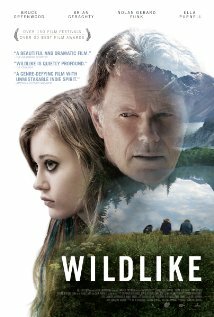 “Wildlike” is an independent drama that tells the distressing story of McKenzie (Ella Purnell), an unfortunate fatherless 14-year-old who ends up living with an estranged uncle (Brian Geraghty) in Juneau, Alaska, when his mother is hospitalized. At first, the uncle seems to be simultaneously attentive and caring but soon reveals an immoral dark side, abusing sexually of the quiet girl who runs away on the first opportunity she gets. Lost and desperate, she walks many miles through the amazing Alaskan landscapes, sleeping in an unlocked car and ultimately finding a motel where she sneaks into the room of the backpacker Rene Bartlett (Bruce Greenwood). When he finds her underneath his bed, he gets startled, but despite his efforts to reach her, she manages to escape without an explanation. Before bumping into Rene again (like a karma), McKenzie approaches a much younger backpacker by knocking at his door and asking if she can take a shower. The young man, seeing her wrapped in a towel on his bed, advances for a kiss, bringing all the recent ignominious memories. The brusque, yet good-hearted middle-aged Rene is marked as the man to follow while she tries to figure out the best way to return to Seattle and contact her mother. The new friends open up, telling more about their lives, a fact that leads the highly confused McKenzie to an embarrassing misstep. The tensest moments in the film are narrow and all together just last a few minutes. They include a fortuitous encounter with a menacing black bear and a couple situations when the fugitive tries to hide from the police officers and the insulting uncle. Evenly plotted, “Wildlike”, which oscillates between the tactful and the warmish, leaves us with the sensation that its developments could be even stronger in order to be treasured. It stands firm mostly because of Ella Purnell’s extremely sensitive performance and the unflinching surprises that the pragmatic Mr. Green takes out of his sleeve.